Oh hey there! My name is Hollie and I'm so glad you've found your way to my health and wellness blog! 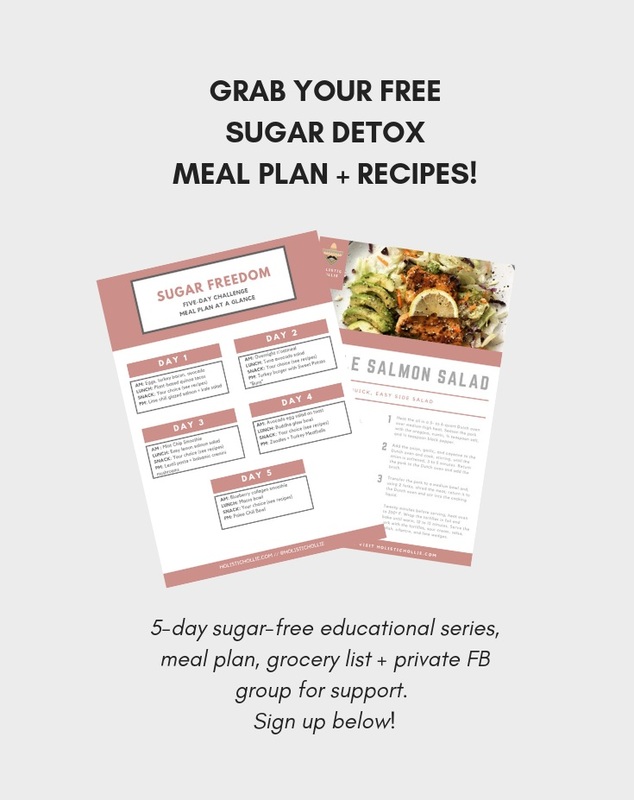 If you're trying to nix your sugar cravings and looking for tasty, refined sugar-free recipes - you're in the right place. Here, you can expect to see delish low-sugar recipes, fitness and movement aimed posts, learn about the benefits of sugar detoxes and may or may not become victim of the occasional sarcastic comment/pop-culture reference/lame dad joke 😉 I also recently added a lifestyle component where I concentrate on fitness, self-care and travel. Ok real talk for a sec: I'm totally a recovering sugar-addict. Yup, growing up I loved fresh, healthy meals... BUT I also loved sugary baked goods, chocolate all day everyday and just all of the high-carb treats that were doing my body no favours - at all. So, in an effort to really up my health game, I've made it my mission to re-create my favourite treats and meals with healthier alternatives. If this sounds familiar, feel free to explore my page and leave me a comment! I am ALWAYS reading the latest nutrition-related articles and studies from sources I trust - I love the science behind WHY something is good for you and only post information backed by science. Bottom line, I aim to inspire my readers to adopt optimal health & wellness habits everyday! I want you to discover how great you can feel - both physically and mentally - when you chose to live a healthy lifestyle. Sooo… what does holistic mean? I mean, I could give you the long-winded definition - oxford dictionary style - buuut I'm not about that formal life. "Holistic" is basically taken from an idea coined by some smart guy named Aristotle, who stated that: the whole is greater than the sum of its parts. Or more specifically, how much better things are together than as individual pieces. There are many contexts where this reigns true; families, relationships, sports teams, even your iPhone in a tangible sense. And of course for the purpose of this blog, overall health and wellness. Holistic nutrition is a natural approach to health that uses evidence-based techniques for diet & lifestyle that focuses on the synergy and balance between body, mind, spirit and emotions to achieve optimal wellness - something I could not agree more with! Originally from a small town in Newfoundland, I'm currently living here in Toronto! I have a Bachelor of Commerce degree and a Fashion Merchandising diploma. I recently decided to became a student at CSNN - The Canadian School of Natural Nutrition where I'll eventually become a Registered Holistic Nutritionist. I'm so happy and thankful that I'll finally be able to combine my creative skills, strong interest for recipe development and content creation, nutritional knowledge and love for helping people realize how good they can feel into a career that I am so, so passionate about. When I'm not annoying my friends with healthy food talk :D - I love checking out new fitness classes, free-diving (slightly ocean-obsessed), blasting latin music, traveling whenever I can and just spending time with friends and fam! french bulldogs, exploring/learning about new cultures and cities, Branch (my hometown) and Newfoundland slang, Jim Halpert & Dwight Shrute & Micheal Scott, travelling, scuba diving, free diving, loud/live music, latin music, maluma, duolingo, overheard subway convos, conan's buzzfeed lists, underwater bubble rings, marine conservation efforts, fitness classes, hammocks, ambitious & inspirational people, dad jokes, sarcasm and dry humour, pop culture references (you'll see), mark manson - his book thooo, natural almond butter, matcha lattes, laughing, singing very loudly in cars, my friends & fam, underwater photography and the ocean.